This week, for my second installment in my month of Thanksgiving cooking, I present to you this rustic maple-caramel custard pie. This may be the most Autumnal pie I have ever tasted. It is, quite frankly, a masterpiece. The maple custard is based off Nancy Baggett's recipe, but I dressed it up with a caramel layer and a few dashes of spice. The caramel bubbles up the sides of the crust and then sets firmer in the fridge. The crust is buttery and flaky, and the custard- oh, the custard. 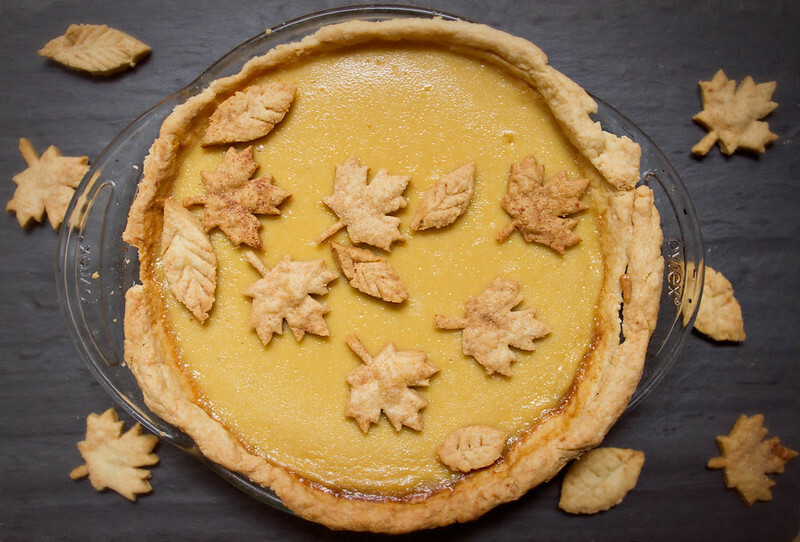 If you like traditional custard pies you will love this maple laced version. 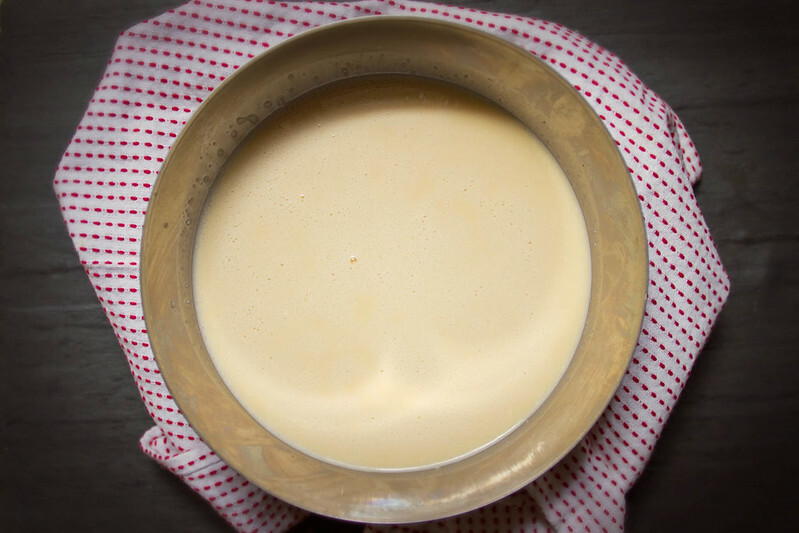 The custard is thick and silky, with a light brown dulce-de-leche color. 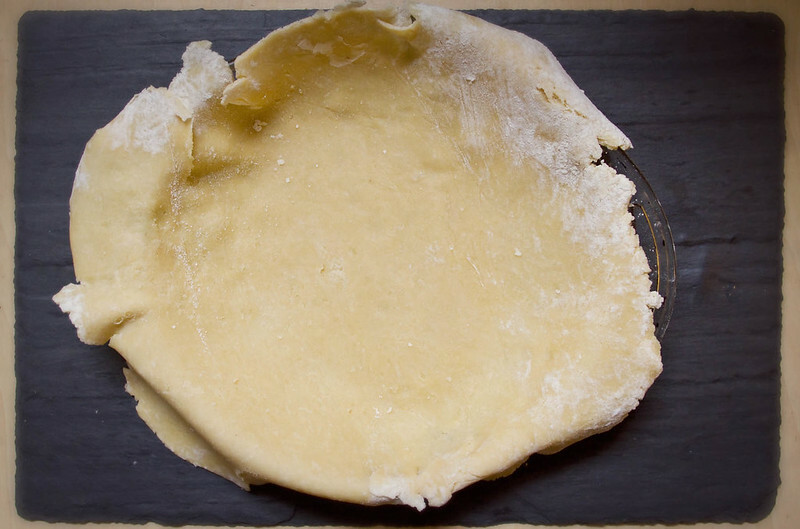 Prior to decorating, the bare pie resembled a giant harvest moon against the inky darkness of my slate board. The taste is creamy, lightly spiced custard doused in deep, complex, dark amber maple. The syrup is definitely the main flavor, but it doesn't overwhelm the creamy custard. 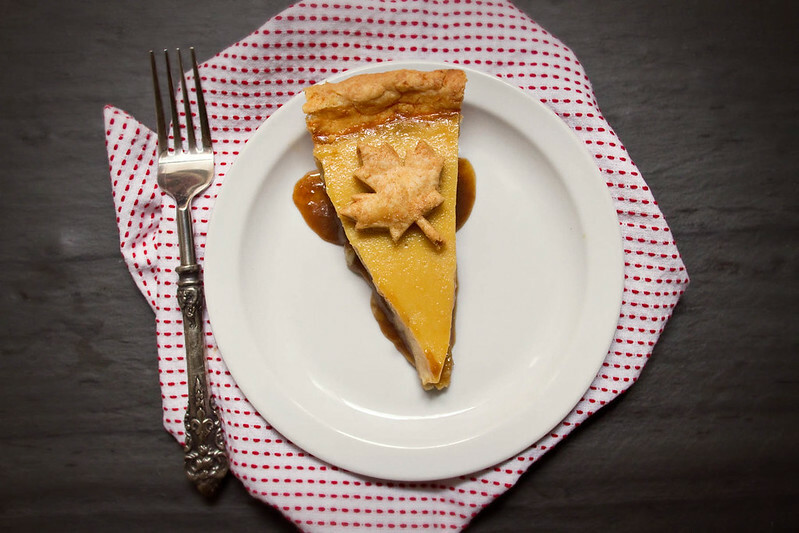 The caramel intensifies the maple flavor, and plays off it, adding a that nutty-lightly-burnt-caramel taste to the already complex pie. It nestles against the flaky crust and oozes out the sides of a cut piece in a lovely fashion. As we were trying our first slices, I was remarking upon how much I love traditional custard pie, and S said he wasn't sure he'd ever had it. "Does it taste like flan?" He asked, "Because this kind of taste's like flan, but with maple." 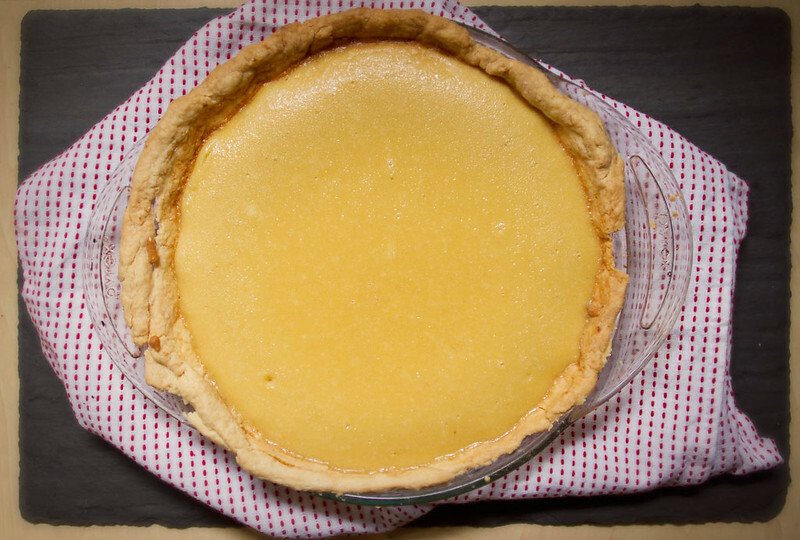 I was surprised, as I thought plain custard pie was a very common type of pie, but S seemed completely unfamiliar with it. I would make him one, but now I don't know if I could ever resist the urge to add maple again. 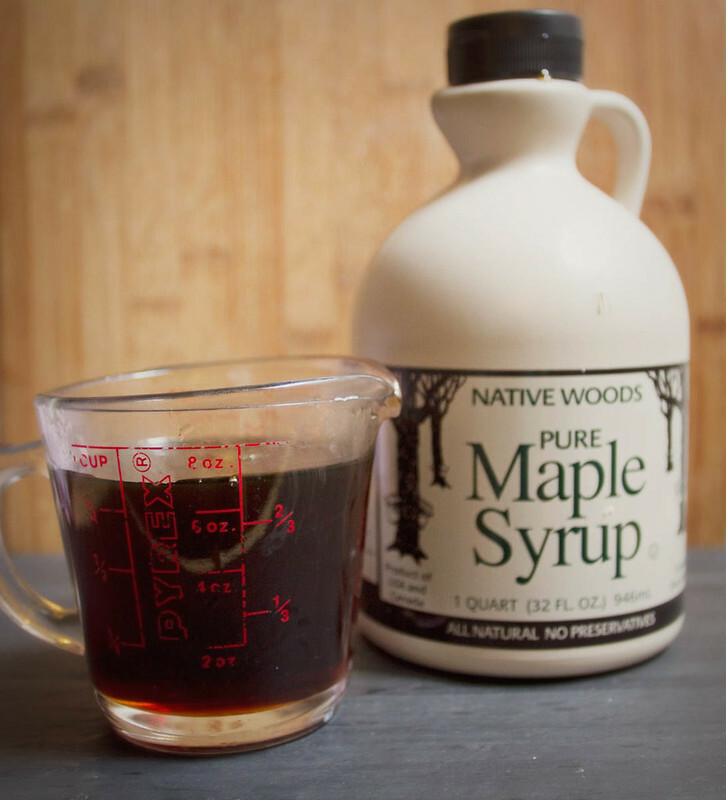 The deep, sweet complexity of the maple was a fantastic alternative to sugar. I have always been a fan of true maple syrup. When I was young in Ohio my mother would take me to an annual sugaring in a nearby park, and we would watch the big, bathtub-sized vats of syrup boiling away, and the men stirring them with long wood sticks would let me take a turn at stirring the syrup, there would be syrup to sample, and hot syrup poured onto snow to make delicious maple candy. My family also skiied at a resort that tapped their trees in western New York, and when I was young they had a sugar shack on premises, and on sugaring days there was always a sweet smell in the air on the chairlift near the Sugar Shack. I used to sit on the lift, swinging my tiny skiis back and forth, imagining hiking off the trail and up to one of those tapped maple trees and dipping my finger into the bucket hanging from it to sample the fresh sap. 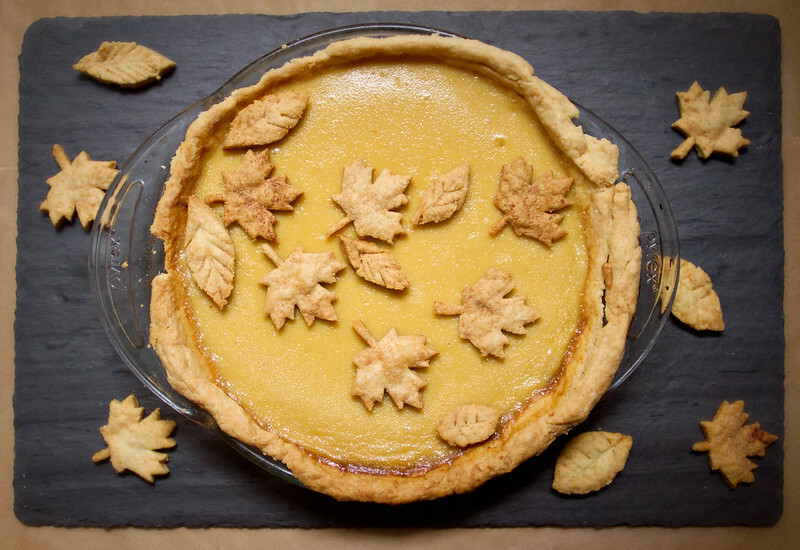 For this pie, I decided to try my hand at decorative leaves. I figured that such a thing as maple leaf cookie cutters probably existed, but I certainly did not have the patience to order them, then put this pie off until they arrived in a week. So I found a clipart maple leaf, printed it out, then used a knife to cut around it on the dough. Truthfully, I was more than a little surprised at how well it worked. I am not a skilled drawer, and unless it's holding a camera, I do not have particularly steady hands, but it turns out dough is pretty darn forgiving. I even freehanded my little teardrop shaped leaves. As adorable as this pie turned out, it tasted even better. It would make a fantastic addition to a Thanksgiving dessert spread, from its autumnal coloring and decorations, to the deep, complex maple-caramel flavor, this is a vey seasonal pie. 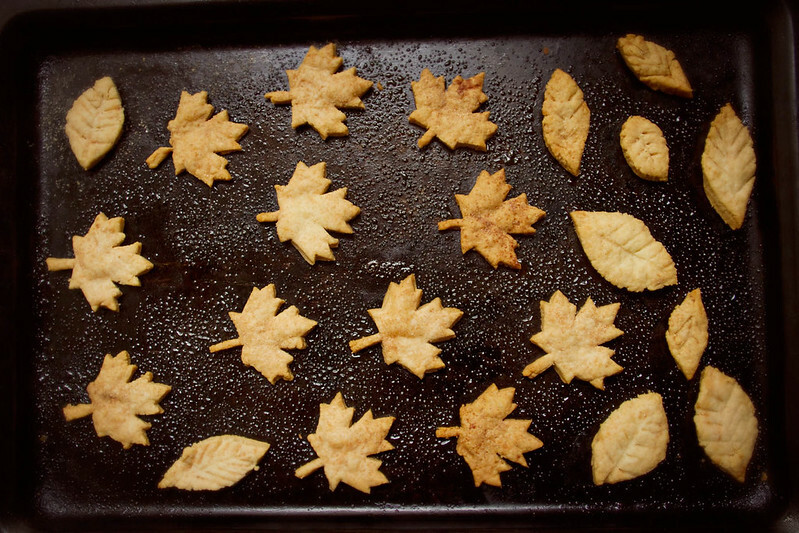 If making maple leaf decorations for the top of pie, make the whole recipe. If you don't want decorations and some extra dough to make pie crust cookies, then 1/2 the recipe for the crust. Combine dry ingredients in food processor, pulse a few times to mix. Add butter and pulse until mixture resembles bread crumbs. Add 1/4 C ice water and pulse to incorporate. Squeeze some dough together, if it clumps well then it's ready, if too dry add another 1/4 C cold water and pulse again. Dump food processor contents onto a large piece of parchment paper or plastic wrap, divide in half, and form dough into two disks. Wrap in plastic wrap or parchment paper and refrigerate at least 1 hour. 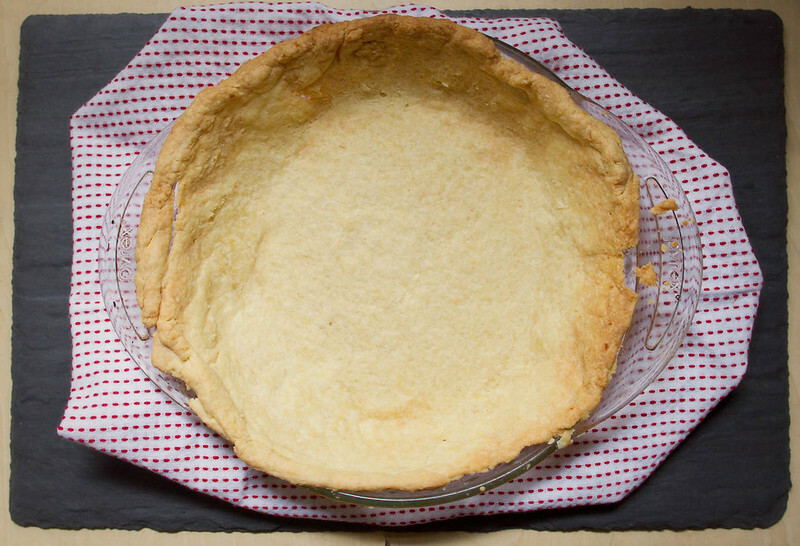 After dough is chilled, preheat oven to 400 degrees, roll out dough and place in a greased pie pan, forming to the shape of the pan, then trimming edges. Line dough filled pan in aluminum foil or parchment paper and fill the pie pan with dry beans or rice to weigh down the crust while par-baking. Bake crust for 25 minutes, remove from oven, carefully remove foil and dry beans, place back in oven and bake 5-8 minutes longer. Make caramel layer while the dough chills. Mix brown sugar, butter, half'n'nhalf, and salt together in small saucepan over medum-low heat. Cook until well combined and then reduce heat to low and cook until thickened 6-8 Minutes. Add vanilla or almond extract and cook another 2-3 minutes. Remove from heat and set aside. After crust is baked, set oven to 325 degrees. In a non-reactive saucepan whisk the half'n'half and cornstarch together until no lumps remain, then whisk in the heavy cream, cinnamon, and allspice. Place over medium heat and bring to a gradual boil, whisking all the while, until it thickens slightly. About 2-4 minutes. 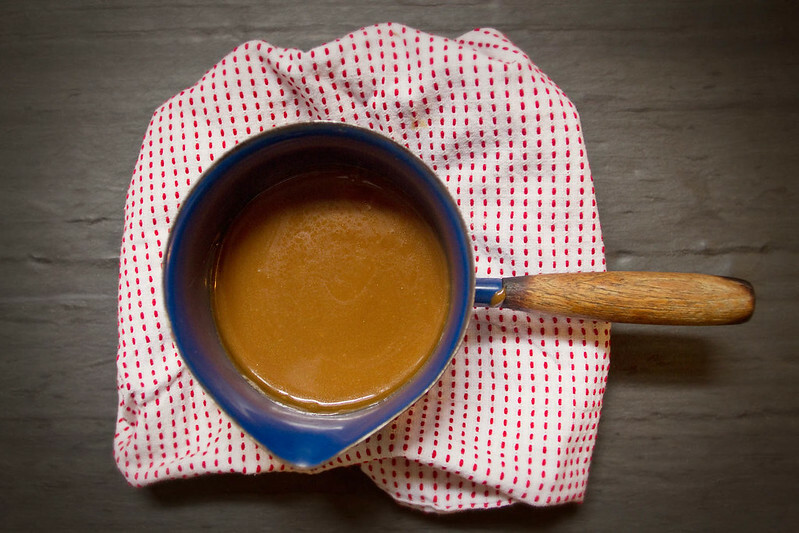 Warm caramel at this time in a bowl or saucepan in a warm water bath if it has thickened and cannot pour. Remove from heat and cool five minutes. While cooling, in a separate, heat safe bowl, whisk together the eggs, maple syrup, salt, and vanilla until well incorporated. Very, very slowly, whisking all the while, pour the thickened cream into the egg/maple mixture. Do this in a slow stream to avoid cooking the eggs with the hot milk. Whisk well once all combined. Pour caramel into the bottom of the pie pan, then pour custard through a fine sieve into the pie crust. Bake at 325 Degrees for 15 minutes, then reduce temperature to 300 degrees fahrenheit and bake for another 30-35 minutes, until all but the center of the pie is set. The center can remain a bit jiggly when you take it out of the oven. Cool on a wire rack until room temperature, then refrigerate 2-3 hours, until chilled. 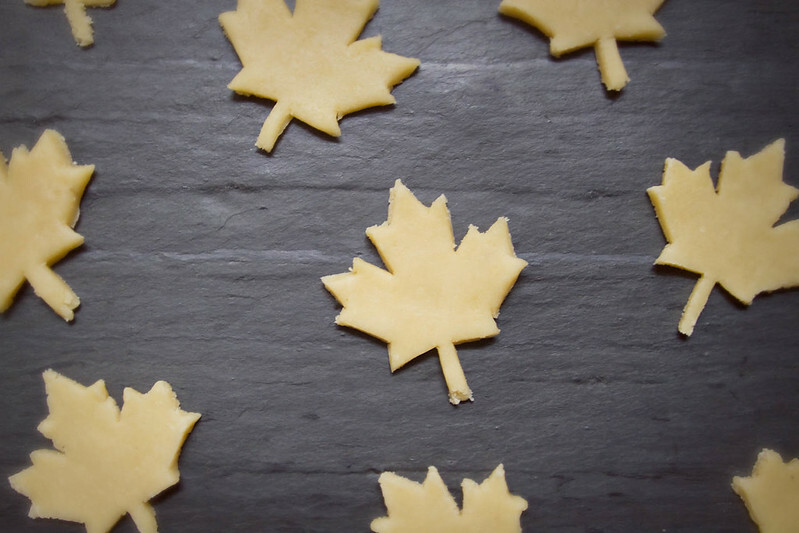 While the pie bakes, if you want, roll out remaining pie dough, and using a cookie cutter, like this one , or by using a knife to trace the template provided (follow link, right click, select original size, then print), cut maple leaf shapes into the rolled out dough. feel free to freehand some other types of leaves too, if you want. After pie is out of oven, heat to 350 degrees fahrenheit and place maple leaves on a greased cookie sheet and bake 10-15 minutes. Once pie has chilled at least one hour, arrange leaves on top of pie in whatever manner you like. They'll stick to the custard as it sets. I like to remove the pie from the fridge about 20 minutes before serving. This is just lovely! I am very anxious to taste it for myself too. Maple and caramel sounds like an amazing (and unique) Fall pie... I'm going to save the recipe. Thanks! It was intensely delicious pie, I definitely ate way too many pieces myself! Hope you enjoy it! I just discovered your blog and I'm LOVING this pie. What a nice change, and I love the rustic look! Thanks! It was my first maple pie, but I'll definitely be making it again (and again, and again)! I made this for Thanksgiving last year and it was a HUGE hit! Made this last thanksgiving and it was delicious! Had a hard time getting it out of the pan, though; the caramel escaped the crust, but it was my very first pie and TOTALLY worth using the elbow grease to get it out. Planning on making it again. So glad you found the pie worth the effort! If you make it in the future, I would say just be sure there are no holes or gaps in your crust (this is especially tough for you first few pies- believe me I'm still not a crust expert! ), where caramel could leak out.